VeryPDF HTML Converter has been designed to convert web page to PDF. It provides two versions: the GUI (graphical user interface) version, and the command line version. This article will shed light on the command line version, VeryPDF HTML Converter Command Line. The command line application of VeryPDF HTML Converter is easy to use, and only requires four steps to convert web page and set PDF subject. You can free download it right now by clicking VeryPDF HTML Converter Command Line. After you install it in your computer, please read the following steps to set PDF subject and convert web page. 1. Save the web page as HTML format. If you are viewing the web page in Firefox, you can save the web page as HTML in the following way. Enter the full file name including the file extension like HTML in the as “File name”. Click “Save” to save the web page on your computer. In this article, we save the web page on disk D and named it “in.html”. Click “OK” to open the command prompt window. When the black and white command prompt window appears on your desktop, please enter a command line in it. The command line syntax below can tell you what should be included in a command line. The angle brackets are used to enclose essential contents. string refers to character string. According the command line syntax illustrated above, first, you should enter the directory of the command line application named htmltools.exe. Second, you should use –subject to define the PDF subject. For example, if you want to define the PDF subject as “command line application”, you should enter –subject “command line application” in the command prompt window. Third, enter the directory of the input file. Fourth, enter the directory of the output file. For example, the command line below can be used to define the PDF subject as “command line application” and convert web page to PDF. D:\htmltools\htmltools.exe ----can be used to call the command line application located in the folder called htmltools on disk D.
D:\in.html ---- the directory of the input files. It represents the web page file named in in the format HTML on disk D.
C:\out.pdf ---- specifies PDF as the output format and can be used to place the result PDF files named out on disk C.
The last step is to press the “Enter” key. 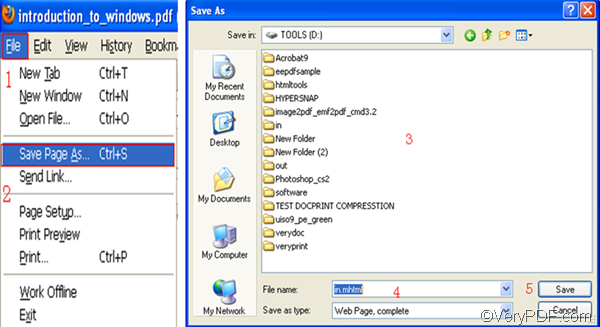 Your computer will begin to convert web page to PDF right away. You can view the process information in the command prompt window. Each time when one file has been converted from web page to PDF, “result =OK” will be displayed in the command prompt window. If you want to buy VeryPDF HTML Converter Command Line, please click Purchase. How to convert Word to PDF and set PDF subject via command line? How to convert pxl to bmp? Convert pcl to pcx and set color depth via command line? This entry was posted in VeryPDF Blog and tagged command line, convert web page to PDF, set pdf subject. Bookmark the permalink.